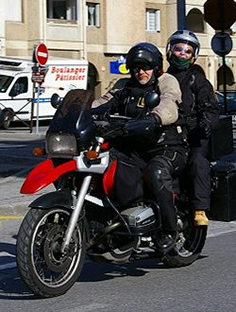 Those who have followed our two articles “The European Chop Shop” and “Long Forks Or False Prophets” regarding whether the European Commission is banning ““extreme chopper style vehicles” will be interested and intrigued to read a report from the Swedish Riders organisation which contains a statement from FEMA’s (Federation Of European Motorcyclists Association) General Secretary, Aline Delhaye. 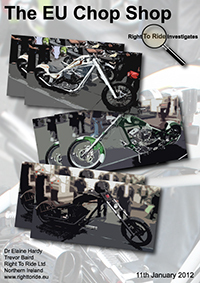 We previously explained that extreme “Chopper” style brings to mind motorcycles with long forks, stretched frames, high handle bars, modified from an original motorcycle design or built from scratch. Choppers should not be banned in the EU! In more and more Swedish sites there are articles that choppers are to be banned in the EU. It is still wrong. It is totally misleading and a result of people taking a detached view of a working group meeting without accounting for the whole truth. 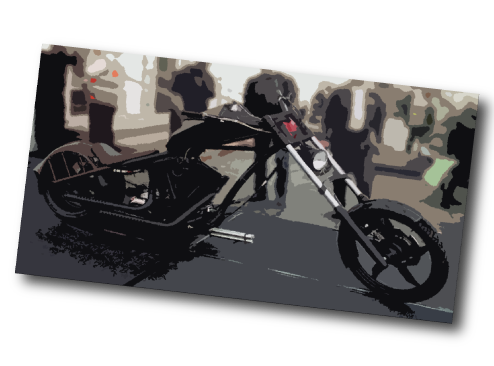 With SMC, you are a member of FEMA that lobby in Brussels for the future for us to build on, including amateur build and modifying motorcycles. A new regulatory framework for approval is being discussed at the moment but the regulations are primarily about the requirements for standard bikes relating to an approval date. For example, the motorcycles will have ABS, requirements for exhaust emissions and the like. “In the discussions along the type approval regulation, FEMA and its member organizations including SMC are working hard to convince members of the European Parliament and Member States to make sure that individual vehicle approvals apply in particular “to unique vehicles built by private individuals.” FEMA and SMC are also trying to exempt private built vehicles from stricter type approval rules in order to keep costs to an acceptable level that otherwise apply to mass-produced motorcycles. The consequence otherwise is excessive costs and demands on the individual builder. In the current discussions on the approval rules, FEMA and member organizations that SMC has worked hard to convince the parliament and member states on the issue of unique motorcycle built by private individuals. FEMA and SMC naturally try to keep these vehicles off as many rules as possible that otherwise apply to mass-produced motorcycles . Apart from that, in the discussions on test procedures to be defined in the delegated acts, the Commission is proposing to include testing of steer-ability, cornering properties and turn-ability into the type approval requirements for new motorcycles. These ideas have not only been criticized by FEMA but also by the Motorcycle Manufacturers in Europe (ACEM) and several member states. These concerns have been taken into consideration by the Commission. Long forks should be addressed by individual approvals, not by the EU regulations, therefore we expect that the approval of long forks will remain at the discretion of each Member State. SMC works with SFRO on matters relating to amateur and rebuilt vehicles. We want a framework that allows these vehicles, provided that they meet the national requirements we have in Sweden. This does not stop tests, such as brake tests at 120 km/h. Cooperation began in 2000 when the same question was under discussion. We did then and we will do it now, SMC is convinced of this. SMC has read the proposal from the Commission. SMC travelled to Brussels and met the EU Commission together with SFRO, to talk about the importance of a regulatory framework that enables us to keep the rules of amateur-built and rebuilt motorcycles in Sweden. SMC has read the proposals of the European Parliament. SMC has lobbied MEPs to vote, in person and via email. SMC has met with representatives of Sweden in the negotiations. SMC has expressed our concern every time we had reason to do so. SMC has raised the issue at several meetings with representatives of the Transport Agency, based on the ability to maintain our national laws when the new regulations come into force. SMC raised the question yesterday when we met with Sweden’s Minister. SMC has today been informed of the articles on the same issue. There is nothing about long forks, choppers and the like. So, from both FEMA and the SMC once again: There is NO evidence that choppers are to be banned. SMC and FEMA continues to work to clear and transparent rules that make it possible for us to continue to modify, rebuild and have amateur build motorcycles, even with the new EC regulations. When the contents of the four delegated acts are known, a lot of work will be required. Of course, the SMC will continue to monitor what is to be implemented in Swedish law and regulations. 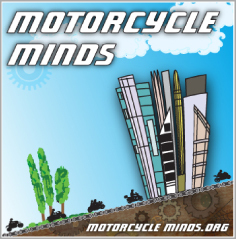 Sweden currently has the most generous rules for rebuilt motorcycles and we want to keep them! SMC is also trying to exempt private built vehicles from strict type approval regulations. The consequence otherwise is excessive costs and demands on the individual builder. We first reported on this issue of extreme “Chopper” style in January and what the European Commission included in a presentation and draft document in December. This was shortly after MAG UK reported on their website, The European Commission has proposed that part of its controversial new ‘Anti-Tampering’ regulations, which will affect all future bikes registered for the road, should be re-written to prevent chop-builders from using ‘long-forks’. Then the issue was reported in two editions of Motorcycle News (MCN ) in February, followed by editorials in Back Street Heroes and 100% Biker magazines. We will continue to report on this issue and those relating to the European Commission proposal and Regulation documents. This will continue to be in-depth. We would like to thank SMC for clarifying the issue and for the response from FEMA, however we are sure the debate on this will continue on who is right or whose interpretation is correct. At Right To Ride we trust our instincts and our judgement to agree that – There is NO evidence that choppers are to be banned. Just to make sure there is no doubt – ‘cos there’s no shortage of debate and scaremongering on-line and in the media – THERE IS NO EVIDENCE THAT THE EU IS GOING TO BAN CHOPPERS! It’s a great call to arms but smacks of a cynical membership recruitment drive, and while it will almost certainly drag people out on demonstrations held to protest against such injustices, I won’t be with them. I’ve got better things to do with my petrol than protest under false pretences. In hindsight, how many people who attended the September demo actually knew what the protest was about? How many thought it was to stop the rise of dayglo? How many thought it was because they were going to ban bikes older then 7 years from cities? Anti-tamper, anyone? How many rallied round the “EU: Hands off Biking” banner. I was there on an anti-dayglo ticket having taken the messages I was receiving at face value and I feel that my trust was betrayed: that was never a European debate; neither is the 7 year limit in cities; anti-tamper only affects restricted bikes defined in existing legislation and the chopper scare is just another bandwagon to jump on. The EU will always debate new laws, but they’re not going to derail stuff that they see as necessary by getting bogged down in high-profile sideshows, or defining terms of reference. Once again it appears the Internet is awash with Type Approval misinformation, this time a rumor that there is to be an “EU ban on choppers”. That rumor is false. MAG Ireland, via our colleagues in FEMA have been following the type approval situation closely. The rumor began on the back of a number of articles in the mainstream motorcycle press, most notably MCN, regarding a “steer-ability” or cornering test, supposedly part of the delegated acts under Article 18 of the type approval regulations, which would allegedly be impossible to complete on a bike with stretched forks. “In the discussions along the type approval regulation, FEMA and its member organizations are working hard to convince members of the European Parliament and Member States to make sure that individual vehicle approvals apply in particular “to unique vehicles built by private individuals.” FEMA is also trying to exempt private built vehicles from stricter type approval rules in order to keep costs to an acceptable level. These exemptions should of course also apply to hand-built choppers. Besides, in the discussions on test procedures to be defined in the delegated acts, the Commission is proposing to include testing of steer-ability, cornering properties and turn-ability into the type approval requirements for new motorcycles. These ideas have not only been criticized as not justified and too strict by FEMA but also by the Motorcycle Manufacturers in Europe (ACEM) and representatives of Italy and the UK. These concerns have been taken into consideration by Commission’s experts. FEMA is closely following the discussions. MAG Ireland continues to work with and through FEMA to monitor the developments around type approval regulations. We believe it is unhelpful to speculate on issues relating to the delegated acts in the absence of any published data as to what they are to contain. MAG Ireland can therefore confirm there is no formal ban on choppers proposed by the EU at Parliament, Commission or Council level.